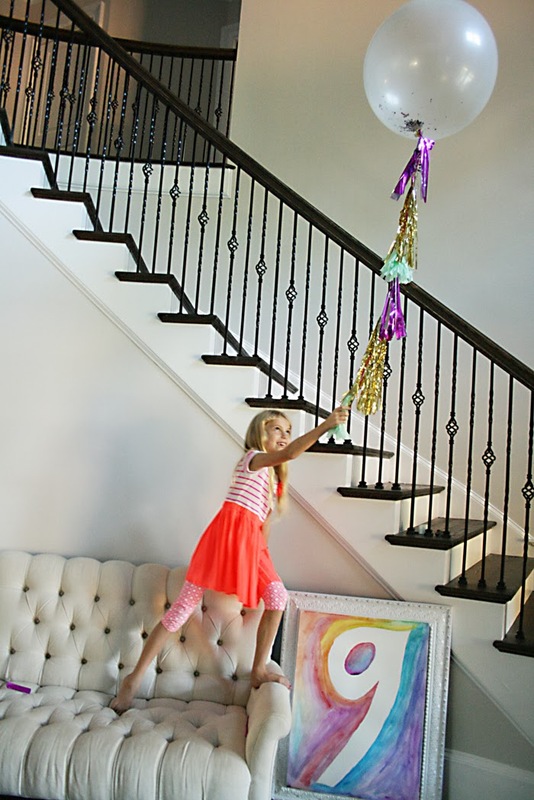 How to Make Jumbo Confetti Balloons with Tassels: I’ve been waiting for the right girly party or any excuse to make a knock-off Geromino tassel balloon, so when Stella’s birthday party was themed around watercolors and paint colors I thought my opportunity had arrived. 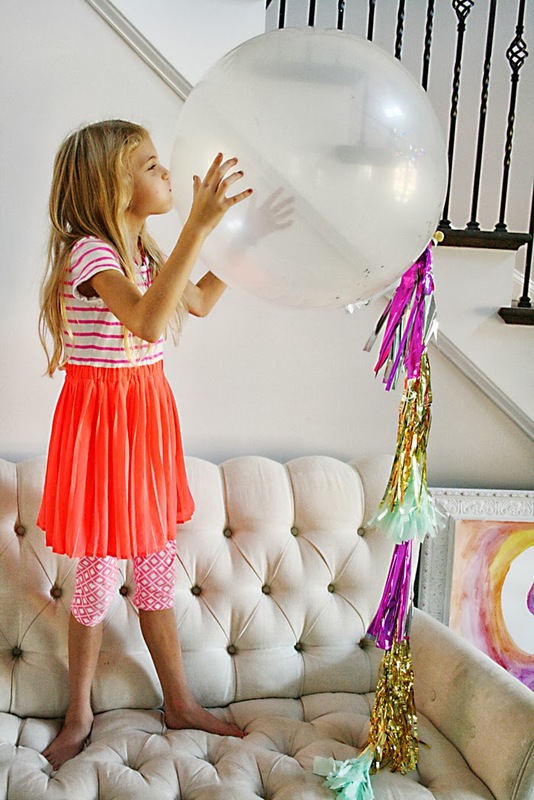 These giant balloons are really easy to make, and if you mess up and it will still look awesome. 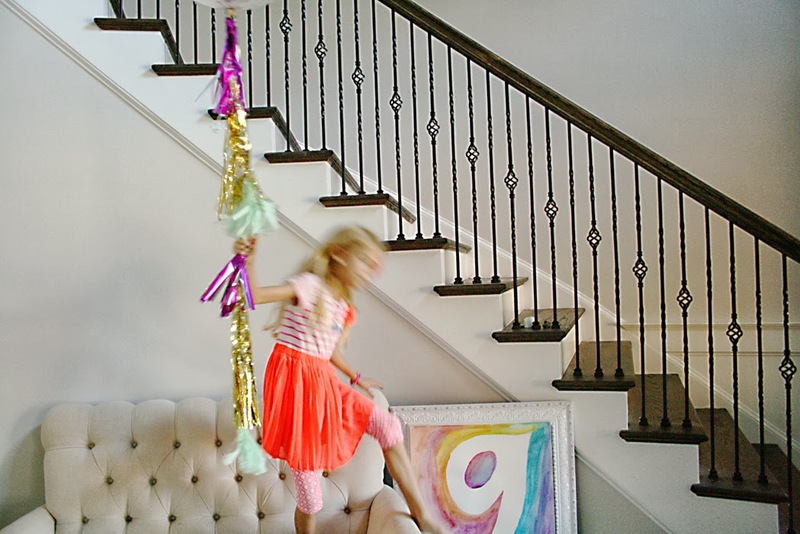 The more tassels and confetti…the better. 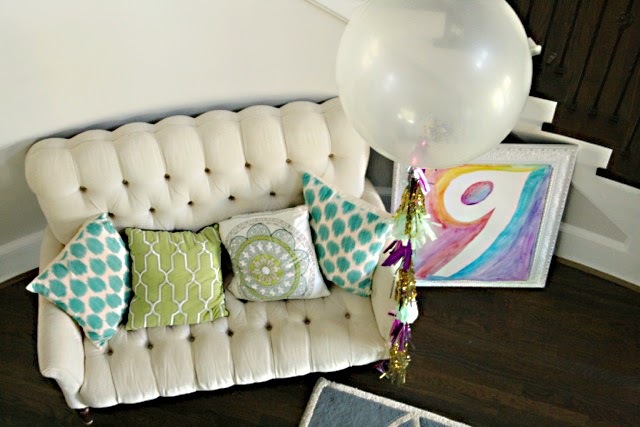 Actually if I had a little more time, I would have added more confetti and tassels to the balloons I made. 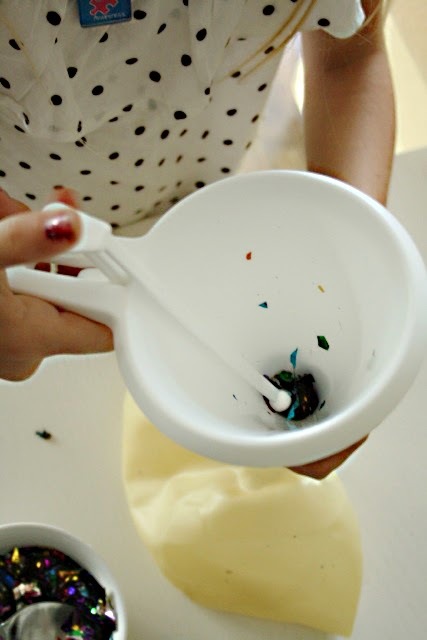 Perhaps making them 30 mins before the party started wasn’t the smartest. More time would of made them even awesome-er! 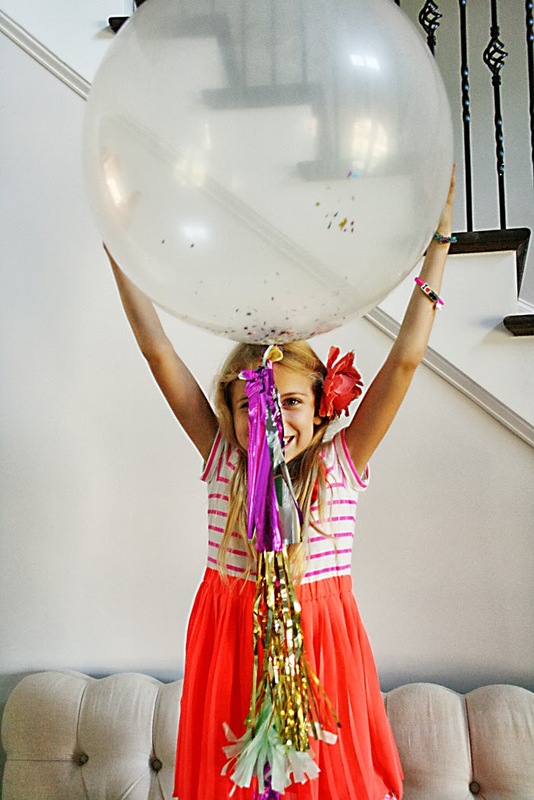 But at least I got some kind of huge birthday party statement and confetti action. 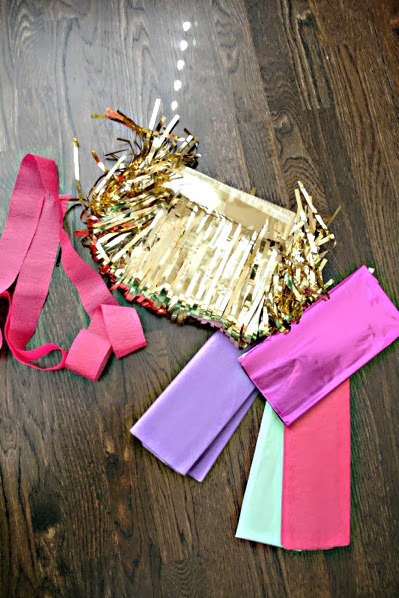 Most of these items I got at a party store like the 36″ clear balloon, confetti, tissue paper, metallic tissue paper and gold foil fringe garland. 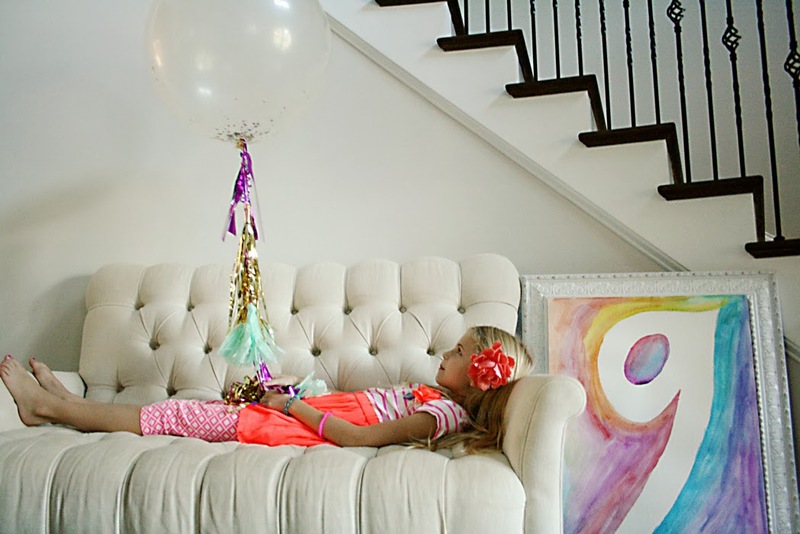 I got the clear balloons a few days beforehand and took them home to fill with confetti. 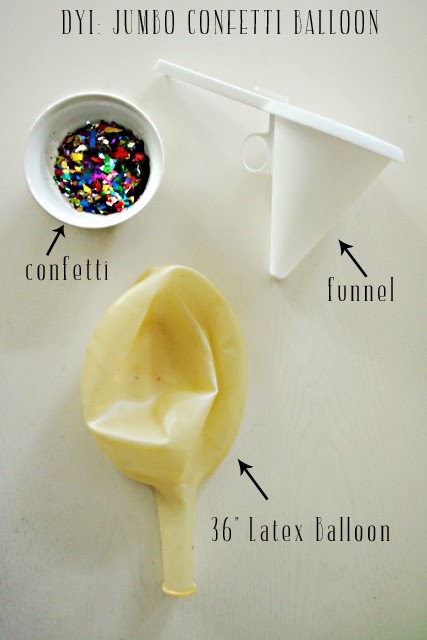 With the funnel, put in enough confetti to cover the bottom of the balloon. 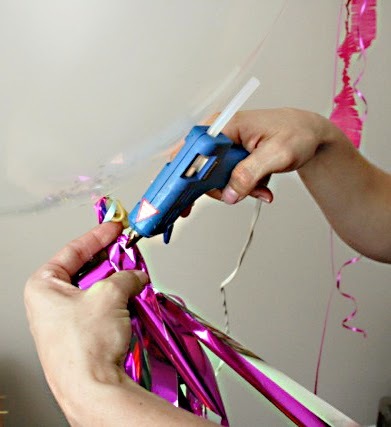 When the balloon is filled with helium, the confetti will stay on the bottom so the more you put, the better the confetti will show in the balloon. We obviously didn’t put in enough confetti. Trial and error. 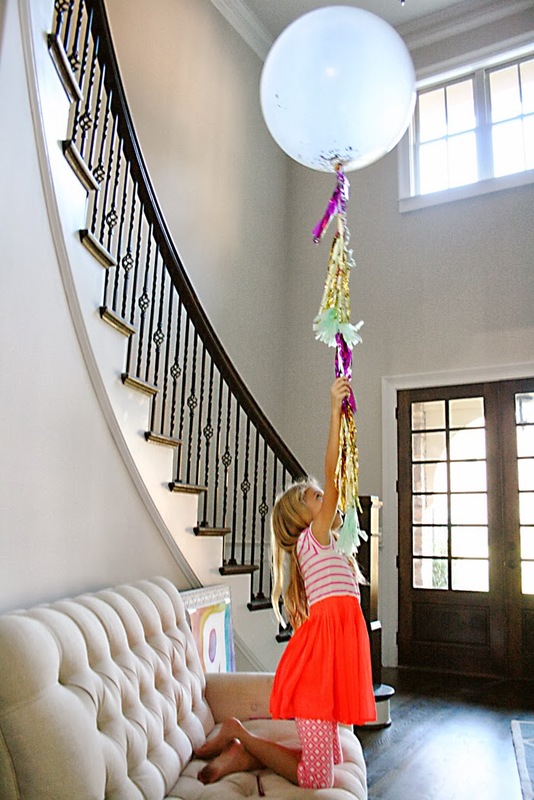 Unless you have helium, you will have to take the balloons to fill up at a party store. 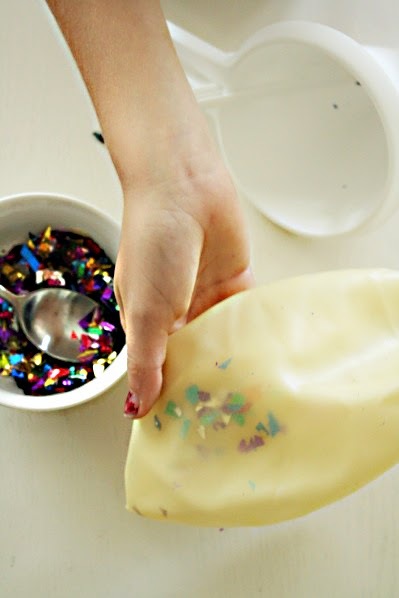 Once the balloons are filled with confetti, grab your tissue and metallic paper. Keeping the paper folded as it is packaged, cut in half. 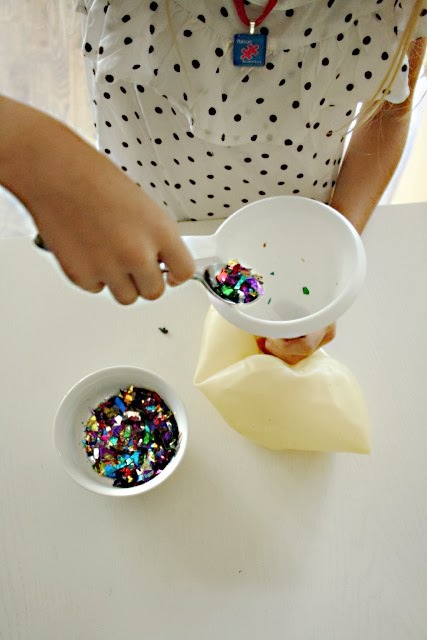 Or if you have tissue paper laying around your house, make sure they are about 5-7″ long with about 3-6 tissue papers in pile and fold in thirds. The more you have the fluffier it will be. Cut each set into 3/4″ fringe. You can do this with a cutting board or scissors. BUT make sure you don’t cut all the way through so it stays as one. Cut about 4-5 ft. of ribbon. Working from the bottom of the ribbon up to the top of the ribbon (or what will be attached to the balloon), fasten each fringed tissue paper by twisting it around the ribbon. 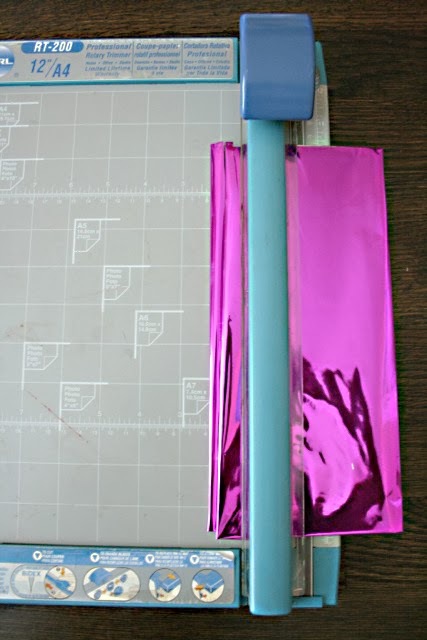 I secured my twisted fringed tissue paper with hot glue, but you can also use a stapler. 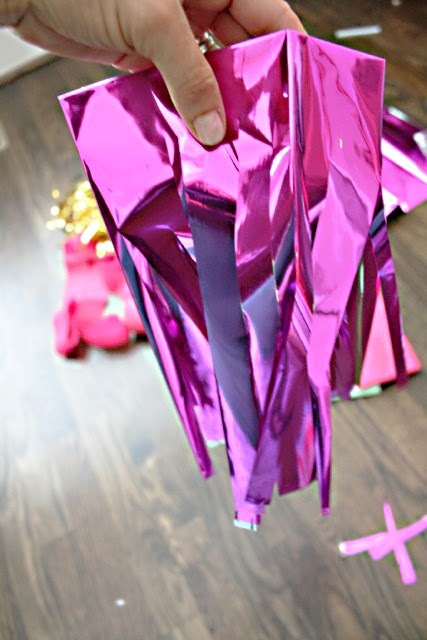 Alternate colored tissue paper with metallic tissue paper and gold fringe garland, which I just cut down by 6″ a section. Leave about 5″ between each tissue fringe. 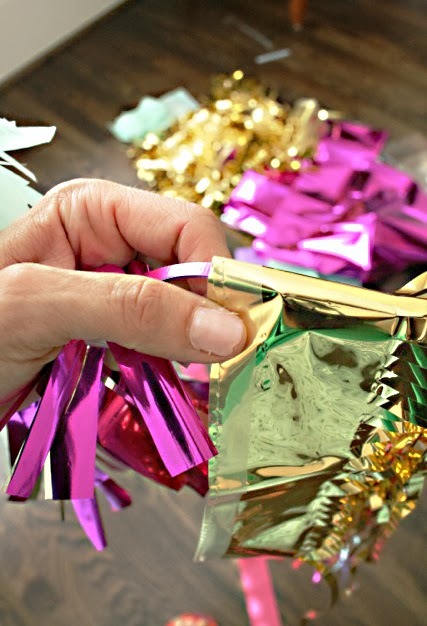 Work your way to the top of the ribbon, leaving enough room to tie to the balloon. 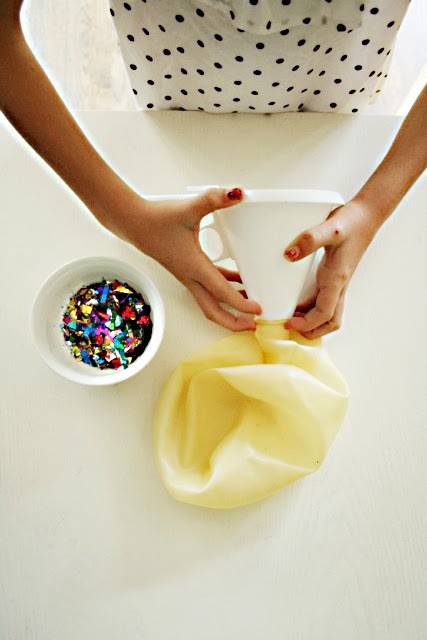 Once tied, fluff the tissue papers. Then take lots of pictures and ENJOY!